Day 30: Extend your brand, think about a bigger strategic plan for promoting your online presence, and set a goal for the next 30 days. Congratulations everyone! We made it, and my thanks to those of you who have been following theotherpalette and for your comments and “likes” which have all been very much appreciated. And special thanks to Michelle (OK, I’m humouring you as requested!) and to all the WordPress team who have guided us along the way. I thought for this final blog of the 30 days I would be a little creative with one or two of my posts and re-present them in a different form. 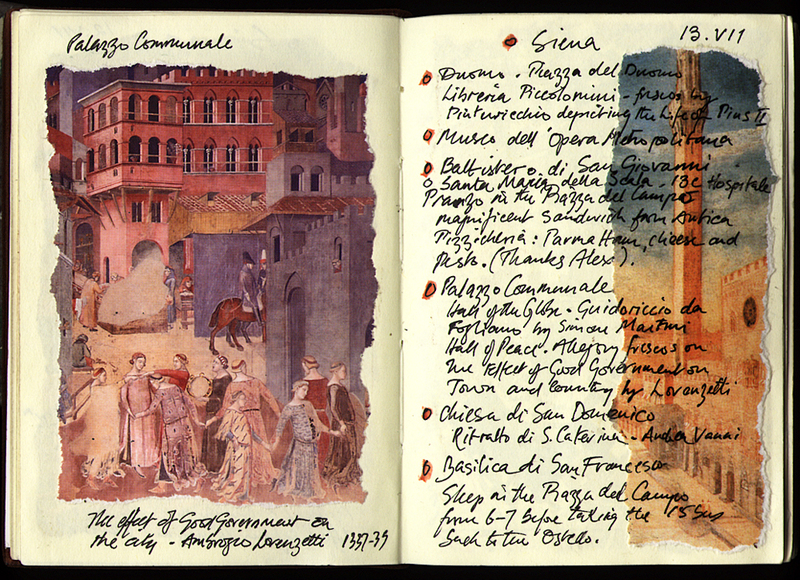 First, a final image to complement Siena revisited and my happy association with Magdalena’s Just Visit Siena, with a page from the journal I kept throughout our Italian “pilgrimage” in 1999, with more to come in the coming weeks. Secondly, I have made our visit to St Antimo into a short video including that beautiful Gregorian chant. Since I do not have the video option on this site I have posted it on thechangingpalette and invite you to view it there; the same photos and music but in video form. Let me know your thoughts. And finally, I have also converted the seagull images from my submission to Sonel’s Photo-Editing Challenge into a very short video, complete with sound, which I have now added to the end of the original posting. Both videos were good exercises using iPhoto, iMovie, iTunes and the seamless video and sound options of WordPress. Now that January and Z2H are over, theotherpalette will be on hiatus for a while with my goal for the next 30 days being to scan many of those old black and white and colour negatives that I wrote about on Day 29 into a gallery of the best, which I’ll post at the end of February. So stay tuned, and if you would like to continue following me on thechangingpalette, I will continue to submit regularly to the weekly photo challenges. This entry was posted in Uncategorized, zero to hero and tagged Gregorian Chant, photography, postaday, Siena, Sonel's Corner Photo-Editing Challenge, St Antimo, zerotohero by Andrew Seal. Bookmark the permalink. I”m glad you’ll be doing the weekly photo challenges, I would hate to see you disappear for a month!